Little House Neighborhood SAL: My First Post! My fabric has finally arrived so I now have all the necessary materials to start this SAL. I'm so late that Nicole and Linda has both finished stitching it. Sigh! I guess an introduction is in order. I'm Veronica from Malaysia. 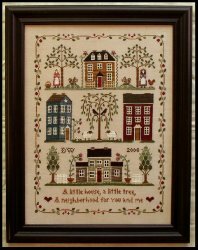 I've been stitching on and off for more than 10 years. Besides cross stitching, I love reading and playing computer games too. Anyway, here's a picture of my fabric and floss. I'll be stitching it with Vikki Clayton silk on Picture This Plus 28 count Legacy Cashel Linen. I've stitched a little on it but not enough to warrant a picture. Hopefully, more pics will be on their way soon. Hi Veronica, I do love your fabric along with the silk threads you are going to use for your Neighborhood! Do not worry about your late start, I am late too... One of the reasons why I love this SAL is that it is a "no-stress" SAL! It is not a race...just a beautiful opportunity to share our joy and passion stitching together this wonderful project! WELCOME! I love your fabby and threads! I like stitch with silk flosses, I think almost all are so beautiful. Good luck on your start. I can't wait to see it with the VC silks! Glad to have you with us, Veronica!